Throughout this past year, I have had the privilege of getting know a very close friend. This friend is a simple, yet profound person whose simplicity taught her to do the small things with great love, and by doing so, has led countless others to come closer to God. I am speaking of St. Therese of the Child Jesus, the Little Flower whose desire to find Jesus in each person has become a great example for millions since her death in 1897 at the tender age of 24. Her approach to spirituality is attractive because its simplicity is easily reachable to the ordinary Christian. Her Little Way teaches us to do all things with great love, to do all things for God in spite of our shortcomings, and to see Christ in all people, even in those we find difficult to deal with. 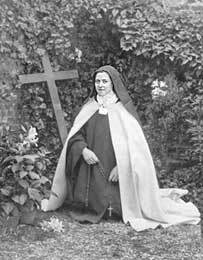 St. Therese has been the model of how I must approach God’s call in my own life. In her autobiography The Story of a Soul (which is a great spiritual treasure), she reminds us that, “Perfection consists in doing (God’s) will, in being what he wants us to be.” (Chapter 1) God’s call to serve Him as a priest is not the result of our greatness, influence, or even worthiness. God calls us imperfect men so that he can use us to magnify His greatness and to allow us to share in His glory. Her simple, Little Way teaches priests and seminarians to approach our ministry and studies with much love, with the understanding that our efforts reflect our love for God and our zeal to minister to His people. St. Therese’s love for God and the Church, which extended to seminarians, missionaries, and even a prisoner, is reflected in how, through her simple approach to faith, this young, cloistered nun from France has become the patron saint of the missions and who example has extended to people in the farthest corners of the world. May St. Therese of the Child Jesus continue to help all seminarians to persevere in doing the work of God so that we may do all things with profound love.